Vulkan He'stan, the Forgefather of the Salamanders Space Marine Chapter leads this beautiful army into battle against any foe. He is accompanied by a converted Chapter Master with Thunderhammer and Storm Shield, and the ubiquitous Librarian. A plethora of Forgeworld custom resin bits are included throughout the army. The Salamander specific Dreadnought is here, custom iconography, as well as turrets for the Razorbacks, and examples of Pre-Heresy Armor are mixed within the troops. Many of the weapons have also been magnetized to make them easily swappable between different army lists. And if you take a close look in the Gallery above, you'll see custom Lava resin bases that really make the Salamander's green power armor stand out. Well, the first Grey Knight army that did so well at the American Team Championship was sold to MBG of Spikey Bits. 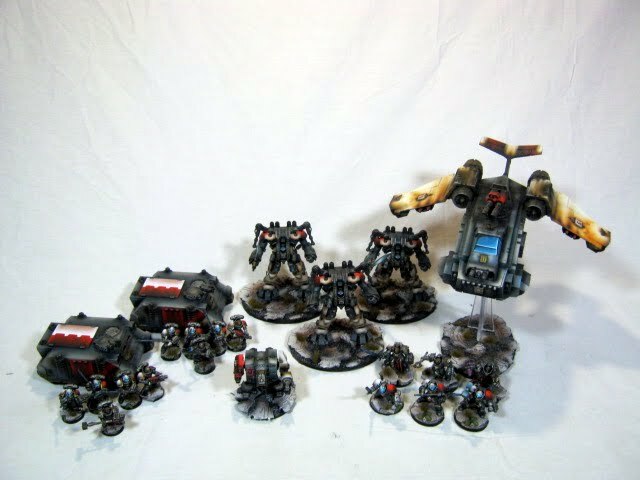 This new Grey Knights army was done for fun and profit! Conversions abound and allow the utmost use of blends ands fades of the airbrush on the shoulder pads and other armor plates. The tanks are swappable between Rhinos with Stormbolters and Razorbacks with Assault Cannons. The Dreadnought carries a custom resin PsyCannon exclusive to the Grey Knights. The Dreadknights have magnetic hands to swap between fists and swords. This army will make an appearance at the Feast of Blades in Denver later this year, and can be seen up close in the gallery above.